Dr. Grabow Repair Service ? 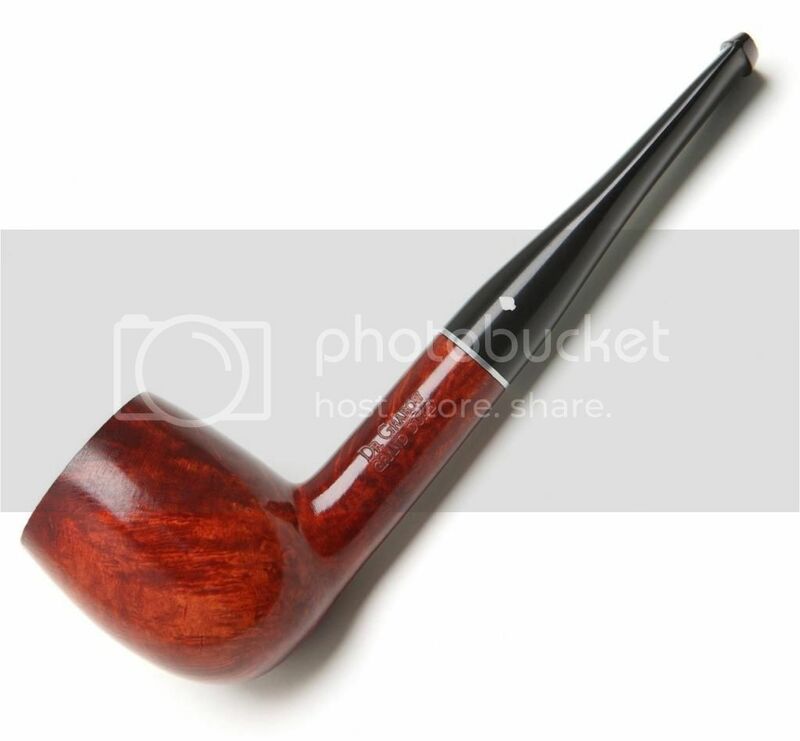 Hey all, I was wondering if anyone here has sent a pipe to Dr. Grabow for refurbishing, and what all they do to the pipe? I have one that could use a little help. The pipe I have is missing the little metal stem accent like the one in this first picture, and I was just wondering if anybody knows if they will replace it. And here is my pipe so you can see what I mean. I think the stem should fit flush with the shank of the pipe in the bottom picture. Regarding Grabow repairs, they replace the stems and buff the pipe. About $12. I've never sent one in personally for repair, but I've talked to a few people that have. Thanks Bud, I don't know what to do about it, I've messed with the stem as much as I feel comfortable doing and it won't go any further into the shank. Thanks. I also have a couple Grabows that are in need of new stems, and it really bothers me. Dr. Grabow pipes are drilled well enough, but their stems are utter junk. Every one of mine has either come loose, or been bitten through. I'd consider contacting them about replacing said stems, but my first question would be "Can you cut my new stems out of something other than the crap you use for your factory pipes?" If not, I may consider contacting Walker. Tooth marks and chatter are one thing, but to have a pipe with a stem that cracks in half after only a year, is unacceptable. customer relations. lostandfound, I'd recommend sticking with the Royaltons with acrylic stems. or PTM Amadeus, but some others. I'm not a fan of Grabow pipes. I'd say send it in if the pipe means something to you. Yeah jerod my stem chewed way beyond repair but it was like that when my dad got it, but my dad gave it to me so it's definitely sentimental and I'd like to see it looking like it did when it was new, and I think think Walker may be a good place to find an aftermarket stem the only problem with mine is its a adjustomatic and I think the (tennon?) Little metal part is heat pressed into the stem. I'm sorry mso489 and cmdrmcbragg I didn't mean for that post to seem like I was looking over y'all. mso489 this particular Dr. Grabow is the only briar I own so I don't know how it would compare to other machine made pipes. And cmdrmcbragg like I said above my dad gave it to me so it is sentimental. lostandfound I don't know if your name is jerod or not but I noticed that name under your comment and went with my gut on it my apologies if it is not. Thanks. I'd say the only thing that pipe needs is to have the threads in the shank cleaned thoroughly. Is the airway through the shank clear? Pass a pipe cleaner OK? .Probably just some built up gunk.There is nothing missing from that pipe. A pipe with that wide aluminum extension would not have had a thin ring on the stem or shank. The factory will replace stems,but you may get an ABS plastic stem if one in vulcanite isn't available.Grabows have used ABS since the 80's,but they do have some NOS vulcanite in stock. They do not make the stems,they are bought from an outside supplier. If you ask for vulcanite they will use it--if they have it. It is possible that the Ajusto tenon has been pulled part way out of the stem. That's an easy fix if you have a way to heat the stem. Is the stem vulcanite? The easiest way to tell( unless it's oxidized green-then it is rubber) is to look at the hole in the end of the stem. The ABS stems will have an almost square hole while the rubber stems will have a wider but not as tall slot. ABS stems also are thicker around the button and bite area and they will not oxidize. Okay ejames, the airway seems to be fine a pipe cleaner go's through it easily someone else has brought up the idea that the adjusto tenon may have been pulled out some but I'm almost certain that it hasn't, other than the adjusto tenon being a little squeaky it has no flex or movement inside the stem it seems to be in there pretty good and from what you described, I would guess the stem is ABS, the stem material feels kind of soft on your teeth but I have never seen any oxidation. Thanks. Yeah, if it means something to you and it's only $12, send it in. Then your problem has almost got to be crud built up in the mortise and or the threads in the mortise. You might not think so, but you can scrub those shanks with pipe cleaners and Q-tips till they come out clean but there will sometimes still be crud in there. I have made some small scraping tools that I use to clean shanks with and have had that happen many times.Scrub till I think they clean then start scraping and dig out all kinds of sh*T.
I've done literally hundreds of those old Grabows. The tools I use most when cleaning the shank is my scrapers and a 5/32" drill bit. If done correctly you will not do any damage. I take a paper clip,straighten one end and then bend about 1/8" on the end at 90 degrees, handy for cleaning crud out of the threads. The pic is of some of the tools I use to clean nasty old estates when I get them in. I've reground or bent the ends of these for specific purposes. 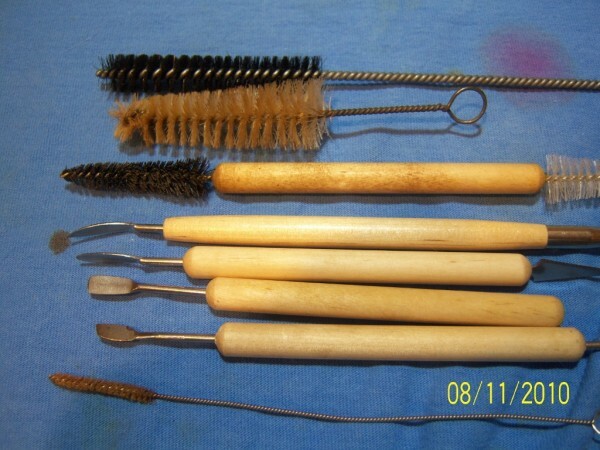 They're just cheap clay sculpting tools.The brushes are handy also for cleaning shanks. Okay, I'll get it down and see if I can pick some of that stuff out and report back. Thanks ejames. Well ejames I owe you an apology for dismissing your original help, it was not crud in the shank threads but during the looking I was doing I have found that the tenon has indeed been pulled out of the stem just enough to keep it from sitting flush, and the stem accent I was sure was missing was nothing more than a small washer. So again my apologies to you and since you have experience with restoring these pipes what would you recommend I do. 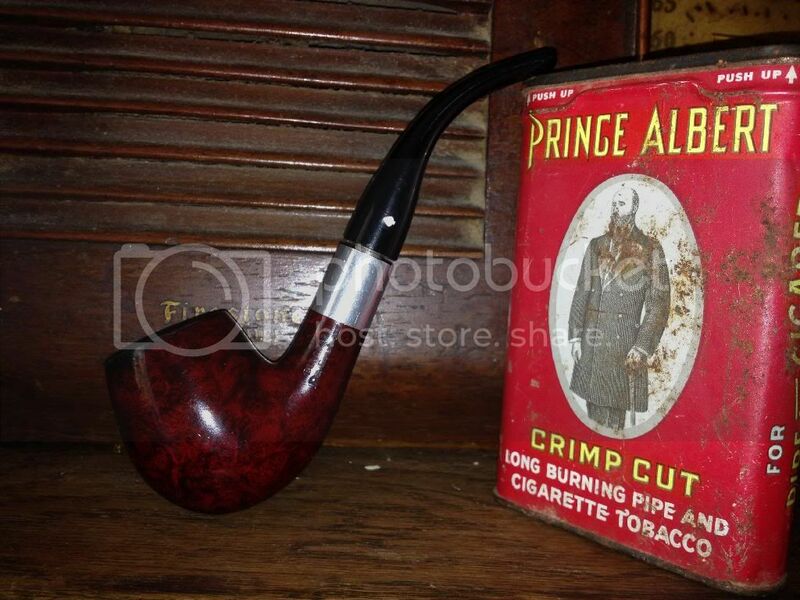 Should I try heating the stem up and pushing the tenon back in ( the only heating tool I have is a standard torch and a zippo lighter ) or should I let Dr. Grabow fit a new stem to it? Many Thanks.